How can we use our Vintage Demijohns for Christmas? They are beautiful on their own, but for the Christmas Season they can be really stunning! You have a beautiful Vintage Christmas Tree, now get dressed the table! 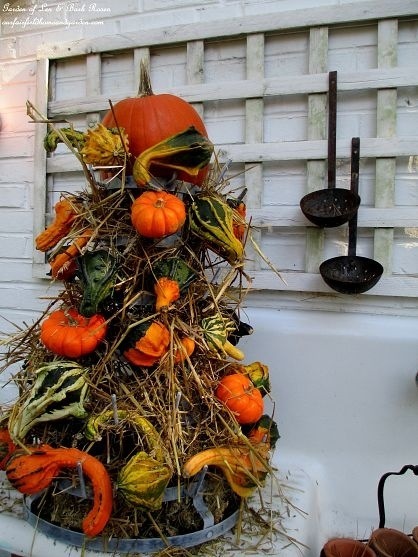 Hiding in a cupboard, you probably have lots of vintage crockery, it’s time to take them out and use them as display with branches, cone pines, red berries branches or holly and poinsettia garlands. Of course you can use lots of other different vintage items, such as kitchenalia items: have a look at those vintage moulds and see what you can do with them! Vintage Christmas Tree Lights: what can we find? And where? The best way to add a real Vintage look to your Christmas tree is to find a Vintage Light! It is from 1880 that we start to see the first electric bulbs in the United States. One of the most famous brand for Christmas Lights since that time was probably Noma’s company. 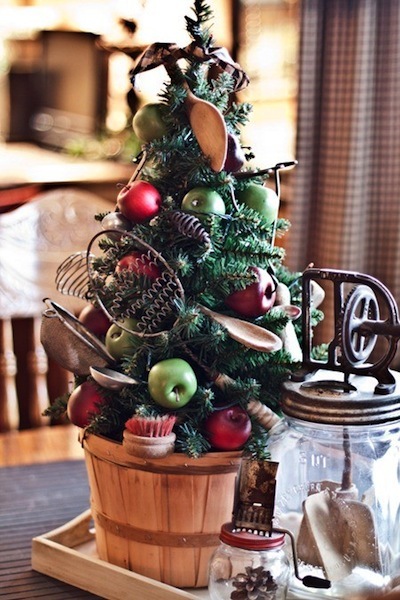 How to choose and decorate your Vintage Christmas Tree? - The star on the top which reminds for the Christians The star of Bethlehem which guided the Three Kings towards the place of birth of the child Jesus, that we celebrate the 25th of December, the star is sometimes replace by a point or an angel tree topper… The tradition says that it’s the youngest child of the family who install the star on the top of the tree (last thing to put to your tree). - The garlands: simple or with lights, white or colorful, you have to put them first on your Christmas tree. You can also find variable material such as ribbons, garland of pearls or diverse objects. - The baubles: sparkling with different colors, some clear of glass, of plastic, all baubles make a wonderful look to your Christmas, and why not trying to find those Vintage ones so beautiful. How to create a magic Vintage Christmas this year? The end of the year is coming with the Festive Season. One of my favourite! I would like to talk about Christmas. How to create a Vintage Christmas this year in and outside your home. 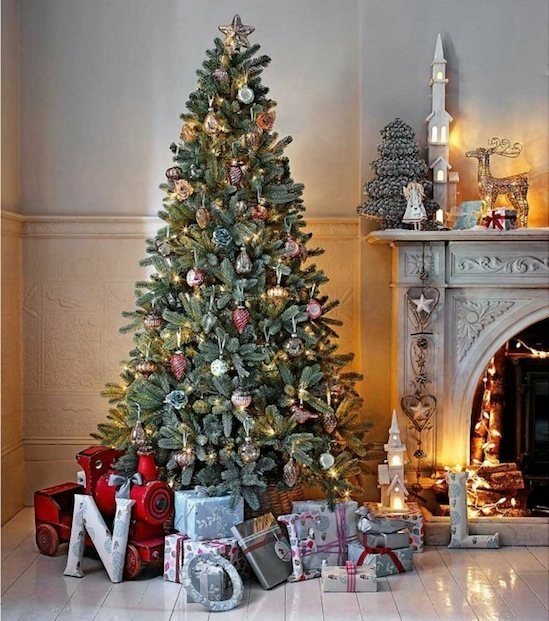 At first, we can start by the story of the Christmas tree, how to choose your Christmas tree and how to decorate it, with the 15 best Vintage Christmas tree! Then, its lights, remember about all those vintage ones. 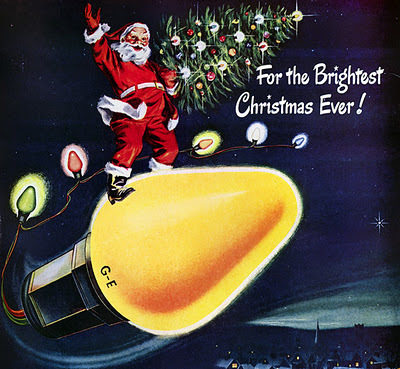 just as a “souvenir” I will show you the 10 most amazing vintage lights. 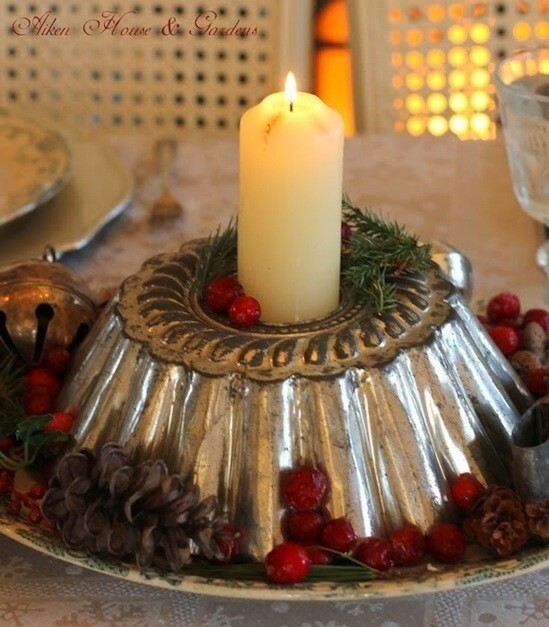 Don’t forget your Christmas table decoration, with lovely centerpieces. I will tell you everything you need to have an authentic Vintage look. 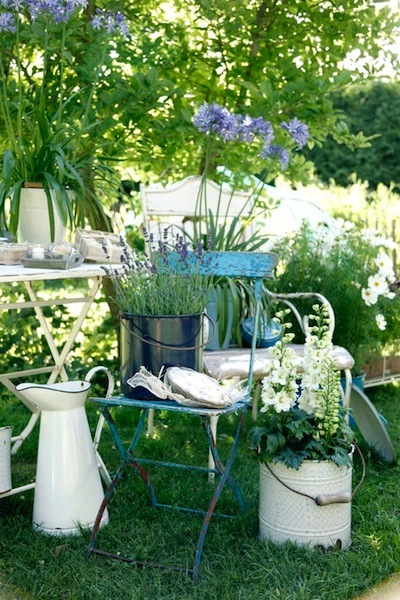 You will find the 10 best Vintage table decoration. It’s getting cold, but don’t forget to add a Vintage Christmas look even outside to welcome your family and friends. I will also talk about the Nativity Scene and its own story without forgetting the “Santons”, famous French nativity characters. And because I’m French, I can’t avoid talking about the French Christmas Market in Alsace, called “Marches de Noel” which are now worldwide known. As a card lover, I will show you dozens of Vintage cards and Christmas commercials that will remember you some “souvenirs” I’m pretty sure! So stay with me until Christmas, you won’t be disappointed! Have a fantastic Magic Vintage Christmas! Vintage Enamel Kitchenware, perfect for your decoration! In the middle of the 19th century, a new material appeared and revolutionized the world of kitchenware. Cheaper and stronger than ceramic, healthier than copper and heatproof, the enamel, created in 1785, became essential. Its only defect is that it’s absolutely not shockproof! It won’t bother it to make a great career for an all century! The first ambition from the manufacturers was to compete the ceramic, then, their aim was to enter in every home. The firsts sets in enamel, luxurious items with ornaments inspired from precious China sets with delicate flowers patterns. Have you ever think about buying a Vintage French Bottle Drying Rack? Also called a “Hérisson” (Hedgehogs) or a “If” in French. It was used to dry all beer and wine bottles upside down on the spikes. But lately, it became a great vintage decoration item. You can find some big ones with more than 200 hooks, or smaller ones with just 12-16 hooks. When you want to choose one, it depends of what you want to do with it and where you want to put it. Do you want it functional or purely decorative? Functional, it can hold mugs, cups and of course bottles. Great if you have stunning pieces to show or if you have drunk some very old bottles of wine! And if you’re a gardener, it can hold and dry your plant pots and everything you need to make your gardening, such as tools, string, gloves… Of course, if you find a galvanized one, you can leave it outside. 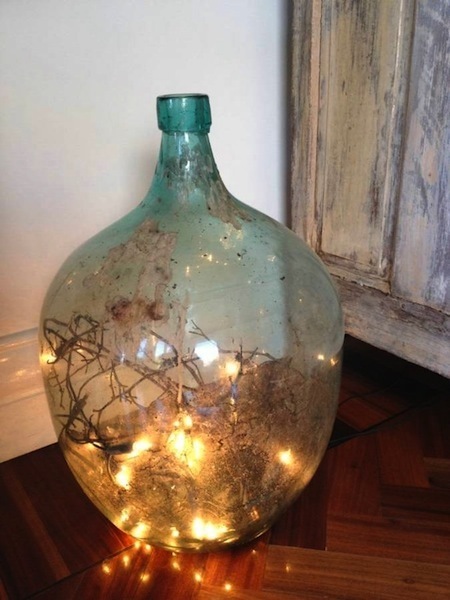 French Vintage Demijohn a must have for your decoration! Are you looking for a big old bottle to create unique vintage decoration ? 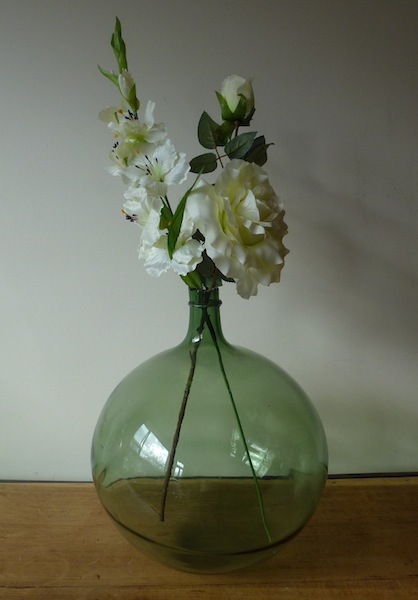 “Dame Jeanne” must known as Demijohn in UK, is what you are looking for. “Demijohn” is an old word that formerly referred to any glass vessel with a large body and small neck, enclosed in wickerwork. In France, Demijohn is called “Dame Jeanne”, literally “Lady Jane”, as a popular appellation. The story says that in 1347, the Queen Jane (la “Reine Jeanne”) expulsed from her kingdom went to take refuge in the Provence county (south of France) walking through the towns of Grasse and Draguigan. Surprised by a violent thunderstorm, we indicated her for asylum, the small castle of a gentleman glass blower to the hamlet of “Saint Paul la Galline Grasse”. After a night spent, the Queen asked to be shown how were made his glassware. A little disturbed, and nervous in the presence of royalty the glassworker blew in the bit of his cane, and overdid the blowing and realized an enormous bottle, which made the admiration of all by its volume of about ten litters. He caused so much admiration that he decided to start manufacturing those big flasks and called them “Reine Jeanne” “Queen-Jane”, but the Queen suggested modestly to give them the name of “Dame Jeanne” “Lady Jane” instead. To protect this big bottle, the glass blower dressed it in wicker. The French “Dame Jeanne” has several names: you can find “Tourie” and also “Bonbonne” in France or “Carboy” in the USA. The word Carboy is from Persian “qarabah”, from Arabic qarraba, “big jug”. Those Demijohns come in various volumes ranging from 2 to 50 litters. Their shape can be oval or round with a flat bottom and a small neck. 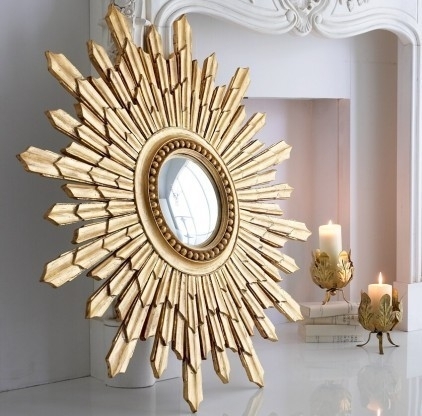 The Sunburst Mirror: a classic Vintage Decoration! 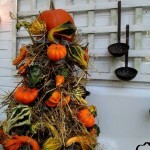 Those fantastic classic vintage decorations Sunburst Mirrors were also called “Witch Mirrors”. In fact, people thought they had magic powers! They first appear in the middle ages, and are also called convex mirrors. We can see some in many old paintings, like the one from Quentin Metsys (1465-1530) “Le peseur d’or et sa femme” “The golden weigher and his wife” which is exposed at Le Louvre museum. Place in front of a window, it spreads the light all over the room inside houses. We could find a lot of those in the Flemish houses and since then, it staid a tradition in North Europe, a classic vintage decoration. It also has the nickname of banker’s mirror because it was helping the bankers, the silversmiths or the usurers, to have a look at the all room at one glance. Sort of early video surveillance, our CCTV monitoring! We also could find some in the Bourgeois’ home: a little distrusting towards their domestics, or by simple precaution, they were having a few in their interior. This special glass, circular and convex with a frame always made of gilt carved wood, has in its centre a top, crowned by an important crest. This quirky mirror also represents an item of power: only the wealthy customers were able to afford such an expensive item! 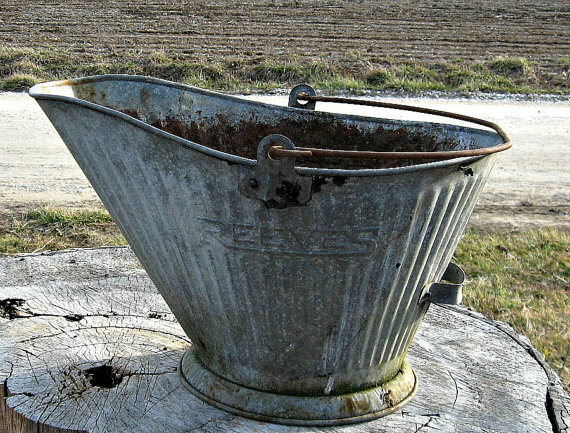 Those galvanized steel buckets are just fantastic vintage decoration. Jugs, coal scuttles, pots, pans, clothes boilers, tubs, waste bins, watering cans, feeding and water troughs, weathervanes, railings and stakes: from the late 19th century the invention of sheet steel and galvanization gave rise to a whole range of items for cooking, cleaning the home, the garden, looking after livestock and agricultural production. It was several decades before this process, which had been invented on the other side of the Atlantic, was industrialized in France. A young zinc worker from france’s Morvan region, Xavier Pauchard, the son and grandson of an itinerant roofer and zinc worker, developed an interest in 1907. In order to perfect his knowledge and to develop new uses, he ordered a generously illustrated book on the subject from the United Sates. Setting up on an abandoned plot of land far from prying eyes, Xavier Pauchard carried out experiments in the bottom of old pots. Neither the harsh climate nor successive failures, nor even the onset of poisoning, could stop him: he went on to master galvanized steel. Whether used for everyday items or for outdoor furniture, galvanization owes its pedigree to Pauchard’s tenacity. French Club Chair: the most timeless chair ever! La Boutique Vintage is now open!